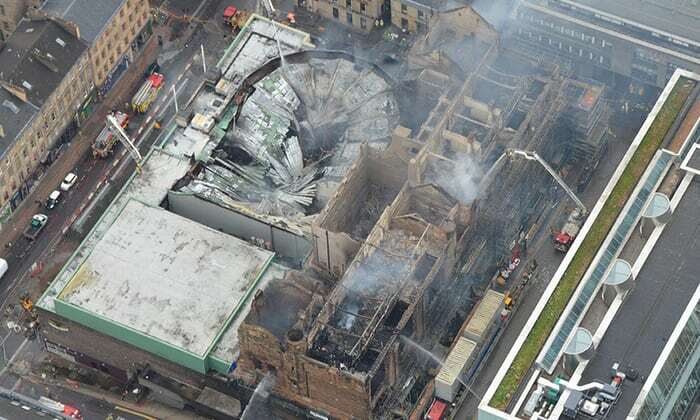 Tom Inns, director of the Glasgow School of Art, has announced that the school’s fabled Charles Rennie Mackintosh building will be rebuilt following the massive fire that engulfed the school last month. The fire that tore through the 110-year-old building is still under investigation as crews begin the difficult work of delicately dismantling sections of the southeast and west facades in an effort to prevent their collapse. In the interview with The Guardian, Inns added a bit of hope to the situation by revealing that roughly half of the fixtures and fittings that had been salvaged and restored after the 2014 blaze that gutted the library were in storage during the most recent fire. The library was partially restored at the time of this year’s blaze, with the £35 million restoration of the complex by Page/Park Architects pushing toward its projected 2019 completion. All that work has gone up in smoke, however, and Kier Construction, the contractor in charge of the initial restoration, has come under fire for perceived lapses in fire safety on the site, including news that the building had not been outfitted with a new sprinkler system at the time of the blaze. Inns and the contractor have since clarified that both parties had agreed to the scope and adequacy of the project’s fire safety strategy, however. Kier has since severed its relationship with the school as the investigation into the fire continues. The school is expecting to use insurance money to finance the rebuilding process, which currently has no timeline for completion. The question of how or whether to rebuild The Mack, as the library building is known, was set off before the latest blaze was even put out. Architectural historian Alan Dunlop has advocated against “replication” of the school while art historians, the conservation group Historic Environment Scotland, and now Inns himself have pushed for restoration.